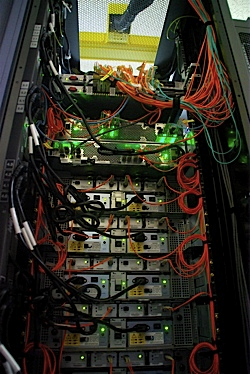 Computers connected together to create a network fall into two categories:servers and clients (workstations). Client computers, or workstations, are the normal computers that people sit at to get their work done. When you use your Web browser, you are in fact using a Web client. When you type in the URL of a web page, you are actually providing the address of a Web server. e.g. www.bbc.co.uk is the address of the BBC’s web server. Your Web browser/client asks this server for the web page you want, and the server ‘serves’ the page back to the browser/client for you to see. Servers are special, powerful computers that provide ‘services’ to theclient computers on the network. Servers are built to be very reliable. This means that they are much moreexpensive that normal computers. In a small network one server might provide all of these services. In a larger network there might be many servers sharing the work.